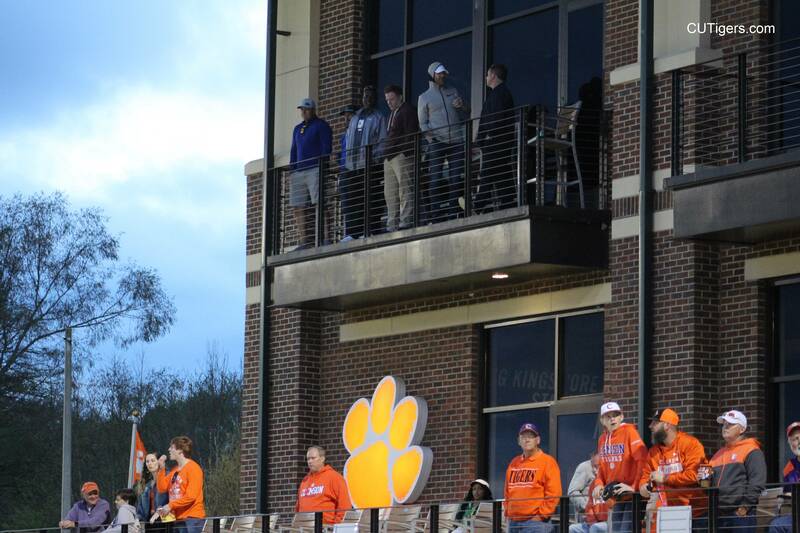 CLEMSON,SC - The Tigers (10-3) beat No.8 Louisville 5-1 in front of 5,474 on Friday, taking a one-game lead for 2nd in ACC, one game behind NC State. What a start to the O&W weekend! Sharpe (5-1, 1.55 ERA) allowed 4 hits w/ 7 K’s and one walk. 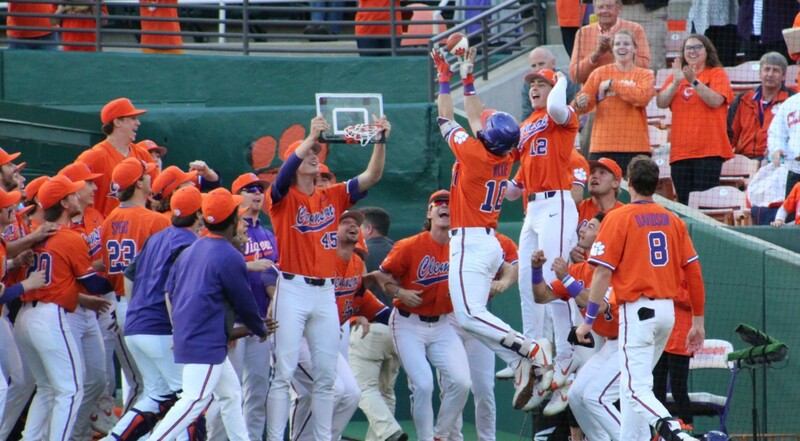 The Tigers christened the “Homer Hoop,” a new celebratory routine, slam dunking a ball on a mini basketball hoop after a HR! It’s roughly the baseball equivalent of Miami’s “Turnover Chain.” It apparently worked because the Tigers hit 3 out tonight. Davidson tied Teo for the team lead with his 8th, and Wilkie hit his 1st in the very next at bat. Freshman Elijah Henderson hit the first of his career as well. I asked Monte and Logan about it after the game. You can see Wilkie going for the slam above. Great addition, and I believe it’s here to stay! 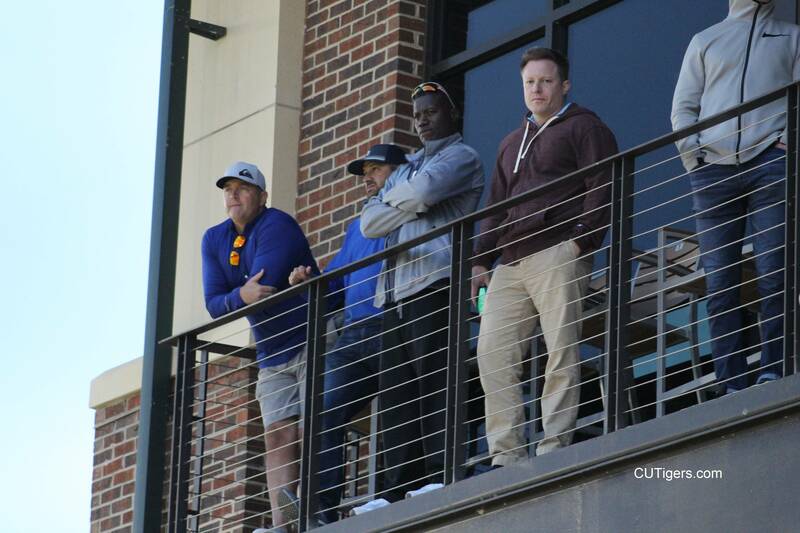 In case you missed it on the game thread, ESPN’s Kirk Herbstreit, Joey Galloway and Chris Cotter were watching the game from the balcony (see below). They are calling the O&W Game on espn2 tomorrow. Herbie's twin sons, of course, will be playing for Dabo in august! The Tigers will try to clinch the series after the Orange & White Game at 5:00 with their best pitcher, Mat Clark, on the mound. As always, I'll have live play-by-play on The Valley forum!